BCI SME Barcode Kit - This kit includes 3 concurrent user licenses for High 5 Software's Service Management Enterprise (SME) software application, designed especially for service companies - provides tools to help you manage your customers, staff schedules, maintenance, inventory and more. Also includes QuickBooks Sync module, Barcode for SME software (used for processing transactions with the MT2000 series scanner), 1 year of software support, Motorola MT2000 series 802.11/Bluetooth terminal with SR Imager, Single slot charge only cradle with Active Sync connection, Cradle power supply, and Cradle to host USB Active Sync cable. The efficient way to manage your service business. 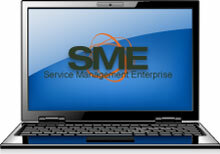 Service Management Enterprise (SME) software was designed with the service organization in mind. Whether you work in accounting, the warehouse, order entry or in the field, rest assured that SME is easy to use and can be configured to fit your business. SME provides modules that synchronize field and office operations so employees can focus on creating value for customers and growing and protecting revenue. The BCI SME-BP2000-BCI-KIT is also known as SME-BP2000-BCI-KIT	or SMEBP2000BCIKIT	.